Egg tarts have always been my go-to purchase at Asian bakeries and a must-have for dimsum. However, it is so difficult to find yummy egg tarts in the Inland Empire. Sure, some bakeries in the area make egg tarts, but it’s always stored in the fridge. In my opinion, egg tarts should be eaten while they are still warm. If you have to refrigerate them, pop them in the oven for five minutes to really get the crumbly, melt-in-your-mouth texture. 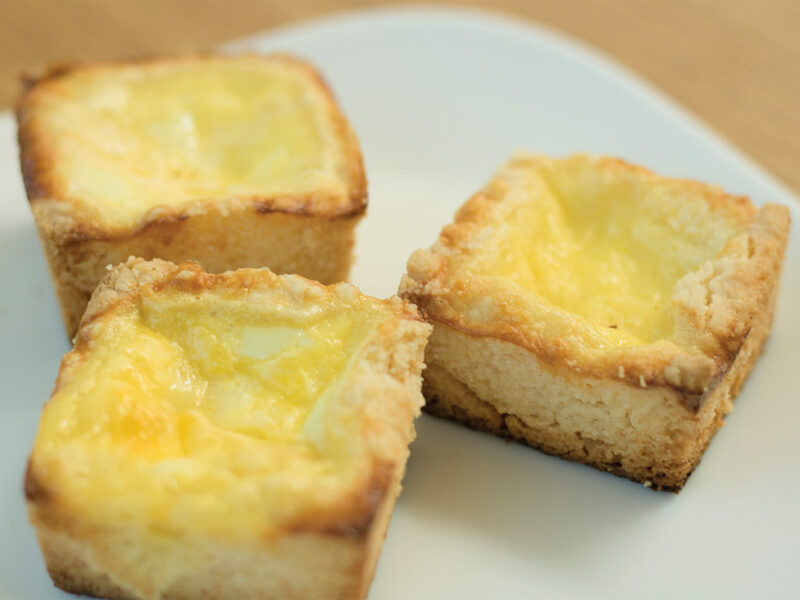 I would say that while the egg custard is yummy, the crust is what makes or breaks an egg tart. The crust should never be soggy, which is why these treats should be eaten fresh. The secret ingredient to my egg tart crust is grated parmesan cheese. I used one of the small packets from Pizza Hut because that’s all I had on hand. The cheese elevates the butter flavor in the shortbread crust and makes these tarts so fragrant. Of course, you can do without the parmesan, but I personally feel that the extra touch is what pulls the dessert together. The key here is to keep the butter from melting in the crust up until it goes into the oven. The butter should be cold when you mix in the flour in order to create a nice flaky crust. The resulting dough should be kept in the fridge whenever possible. The cheese elevates the butter flavor in the shortbread crust and makes these tarts so fragrant. To make the crust, cut cold butter into flour with a fork, or use your fingertips to break up large pieces of butter. Add in the parmesan cheese. The mixture should become like sand, with small flecks of butter throughout. Keep the mixture cold — the butter should not melt. Rest dough in the fridge while you make the custard. Add milk and sugar to a saucepan on medium heat. Stir until sugar has melted, then remove from heat. Do not boil the mixture. Let mixture cool until warm to touch. Mix eggs gently in a separate bowl. You don’t want to incorporate too much air into the mixture; we want a smooth custard without air bubbles. Slowly pour eggs into milk mixture, stirring as you pour. Take the chilled crust dough from the fridge and pack into cupcake tins. Press the crust up the sides as well. You want to make sure there is a consistent layer of crust so the egg tart doesn’t crumble when you take it out of the tin. Pour custard mixture into cupcake tins. Bake at 375 degrees fahrenheit for 30 minutes. Let cool and serve while warm.